After making ice cream recipes using eggs, heavy whipping cream, almond milk, rice milk and cashew milk I’ve finally settled on a concoction that is easy to make, requires no cooking and is vegan-friendly. I use a coffee grinder to grind normal Erythritol into the powdered version. Using regular Erythritol is good but you’ll have a lot of undissolved granules of Erythritol crystals in the mix though still yummy. I’ve used imported Mt. Hagen instant coffee crystals but I think I like good old-fashioned Folgers Coffee Classic Roast crystals for taste. Because this ice cream has both caffeine and MCT Oil in it I wouldn’t recommend this as a snack before bedtime as it may keep you awake. You could use decaf instant coffee instead if you are concerned with caffeine. Coffee Ice Cream packed and ready for the freezer. Make sure the freezer for your ice cream maker is well frozen at least 24 hours in advance. 1. Place coconut milk cans in the refrigerator overnight. 2. Add all ingredients except Salt and Xanthan Gum to the blender. Taste test the mixture and add up to 1/2 tsp of sea salt, if necessary. The sea salt brings out the sweetness in the sugar. Add Xanthan Gum which will create a thicker, creamier texture when frozen. Blend all together in your blender. 3. 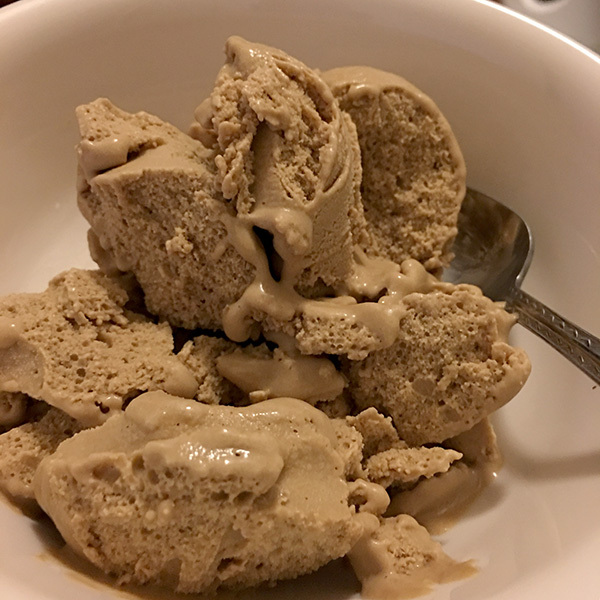 Turn on ice cream maker FIRST, then add the mixture into your ice cream maker and mix for about 30 minutes or until your ice cream turns into a soft-serve consistency. 4. Scoop ice cream into an ice cream container (or loaf pan lined with parchment paper), cover and freeze for an hour or two until the ice cream is completely frozen. 5. To eat make sure you leave the container out a few minutes to soften for easier scooping. 6. You can adjust the sweetness in case your choice of sweetener makes it too much/little in sweetness. Erythritol doesn’t dissolve in cold liquids so if you use the granular version it won’t be as smooth but I have used granular with success. 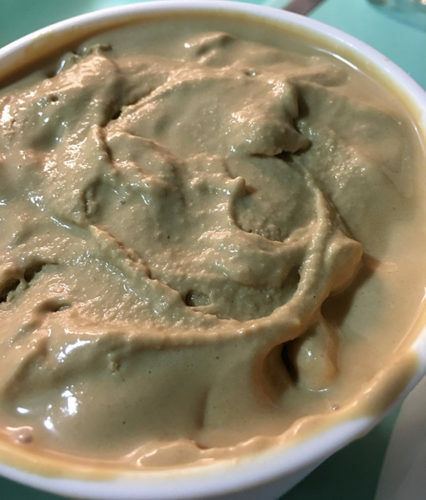 If your ice cream is too rock-hard out of the freezer and you don’t like to wait for it to soften add 1-2 Tbps Vodka when blending the ice cream mixture which will lower the freezing temperature of the ice cream. If you want a Coconut-Vanilla Ice Cream just leave out the coffee. You could also add-in pieces of fruit like strawberry chunks or blueberries or other fruit. You should add the fruit closer to the end of the churning so the ice cream maker doesn’t pulverize them. Scooped into a bowl after the quart being left out to soften first. You know you want some. Nutritional data per 1/2 Cup serving. This data has the sugar-alcohol carbs from Erythritol already subtracted.